“The Queen Of the Light is a beautiful Ally and comes into your life to herald success in all your ventures. She illuminates the most important steps on your path and reminds you of your own brilliance. You are intelligent and inspired, and all your needs will be met. Remember that you are the instrument of the Divine shining through you in this world. You are on the correct path for your highest good. The Queen also brings you insight into how you manifest your reality in the most miraculous ways. She promises that you will be shown the next right action and celebrates you as you stand brilliant, joyful and enlightened in the present time. You have worked hard to come this far. You can be proud to stand tall in your conviction that in your heart of hearts, you know the truth of your situation. Rewards for our perseverance and willingness to learn are on their way. Gratitude and acceptance are key today. 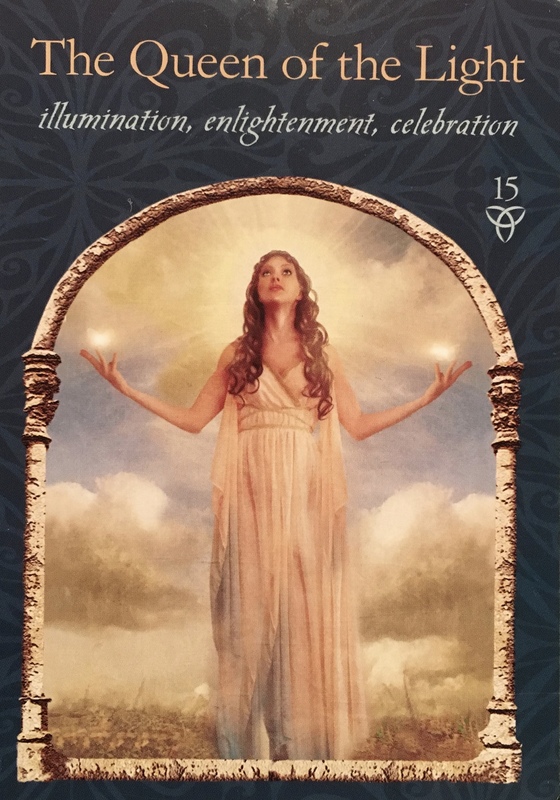 If this card comes to you as challenger: “The Queen Of the Light challenges you to shine your light and not give in to fear. Are you hiding yourself for fear of rejection? Are you as afraid of success as you are of failure? The light of the Divine shining within you is the power that expresses through you. This, not your ego, is the authentic place of self-expression. The Queen Of the Light also challenges you to look at how you are affected by glitter, glamour, and the superficial dreams of society. Are you mesmerized by false power? The material world is fleeting; nothing lasts forever. Make sure your intentions come from deep within you, and do not base them just on money or power or what you think love will do for you. Ask instead what you can offer, what you can give. You are in the perfect position to take a leap of faith as you are sure to be victorious. Do not let fear or self doubt hold you back from the opportunity of a lifetime that is about to present itself to you. You got this. It is in perfect alignment with your destiny, your Soul Path and your Highest Potential. Do not let it fall by the wayside. Fears are the illusions that cause roadblocks in our path. If we let them take charge, and we start to over analyze, we miss the opportunity and have to wait until it comes back to us again. What is yours will always come to you, but do you really want to hold it off when it will create a drastically improved reality compared to what you have been living? Surrender to the Divine Will of the Universe. Plunge in, heart first and give it your best. I get such a felt sense of connection through this. The encouragement is so welcome right now. Thank you! And thank you for sharing what is, has been, or was : ), going on for you. That’s A LOT! I wish you all the best.